The unrivaled capabilities of the Infinity control represent our highest degree of comfort management. This communicating control is designed exclusively for our Infinity system products and is the brains behind our ultra-efficient Greenspeed® intelligence systems. 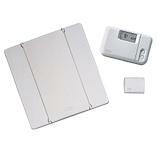 What's more, techno lovers will rejoice over the Infinity control's energy management and remote access features. Your heating and cooling system is where you spend most of your energy dollars, so saving on your utilities is important. 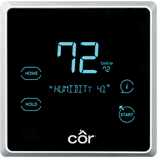 The original Côr™ thermostat is designed to combine home comfort with reduced energy use; homeowners saved an average of 20% on their heating and cooling energy costs. It's what we call the heart of a smarter home. 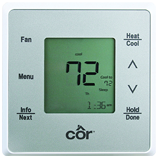 Comfort™ Series thermostats are designed to give you flexible solutions that work on a multitude of systems. 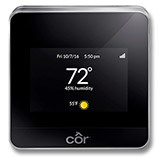 You can choose from models like our Wi-Fi® thermostat to give you remote access or others with easy Touch-N-Go® programming — there's even ultra-simple non-programmable models. No matter the need, you'll find an economical solution to what you're looking for in our Comfort™ Series. If you like flexibility and the customized comfort of zoning, there are a number of reasons to zone right in on this series. It allows you to program temperature and humidity levels in 7 independent day cycles, with options for 2, 4 or 8 zones. Enjoy all this from one powerful control—part of a zoning system that also includes room sensors, and an equipment controller as well as outdoor air and duct temperature sensors. Comfort™ Series thermostats are designed to give you flexible solutions that work on a multitude of systems. 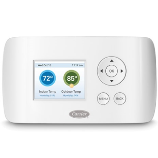 You can choose from models like our Wi-Fi® thermostat to give you remote access or others with easy Touch-N-Go® programming — there's even ultra-simple non-programmable models. No matter the need, you'll find an economical solution to what you're looking for in our Comfort series.